The Angaston Football Club is justifiably proud of its heritage – it has won more A Grade premierships than any of the other foundation clubs. It retains its original colours of blue and white that it started with in 1879. Its picturesque oval is a landmark in the Barossa and will be the scene of many more great football matches during the next 100 years. Commit to our success and sustainability. Commit to our assigned roles. Proactively uphold our vision and values. Explore and create avenues to evolve. Help others with their individual development. Seek to continually challenge the norm. Encourage an atmosphere of mateship. Foster an inclusive and caring environment. Like any great country football club, we wouldn’t be able to function without the help of our sponsors. We would like to thank each and every one of them for showing their support to the club and to the community throughout the years. Support those, who support the club! Visit our dedicated SPORTS CENTRE home page where you can order playing apparel and club merchandise that will be delivered to your door! Click HERE to visit and start buying now. Annual Membership that entitles you to free entry for minor round home games, our weekly Panther Patter newsletters and voting rights at general meetings. The Angaston Football Club was one of the foundation members of the Barossa & Light Football Association in 1908. However the club was ‘formed’ in 1879 playing its first game on July 12, 1879 against Kapunda at Angaston. Kapunda won seven goals to nil. The oldest known Angaston Football Club minute book was from 1899 – 1910 and this still exists. However the next available minute book starts in 1955. In 1936 an Angaston & Nuriootpa Centenary souvenir booklet was printed and in that publication it states that football started in Angaston in 1870. To add confusion to the starting date, in the first known article printed in the Kapunda Herald in 1879 it refers to 1879 as the formation of the Club. All of these facts may be true but according to Angaston Football Club historian, Anthony Schubert it seems that the Club as it is known today started in 1879. Angaston took part in trying to form a competitive football association during the late 1800’s but after a number of attempts the Association did not get officially formed until the 18th March 1908 and Angaston is one of the two Clubs that has not missed an official season in the 100 years of football. In its first official match on May 2nd 1908 Angaston defeated Kapunda 5.11 to 5.2. Charlie Nettell was Captain of the team and the first goal was kicked by Alwin Thamm. The Club has the historical honour of winning the first premiership in 1908. 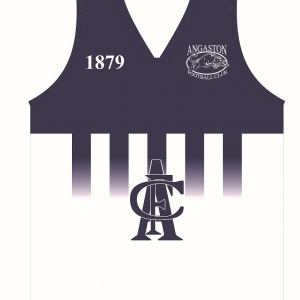 In the early 1900’s Angaston had a number of clubs apart from the one we know in 2008. The Old Buffers Club was formed on July 2nd 1910 – R. Angas was Patron- J.E. Gramp President and C.E. Netell Secretary. It was formed one night after a match between past and present footballers – the colours worn were maroon and gold. A Federals Club wearing red and blue was also in existence around 1912. It is unknown how long these two clubs existed. The early years were extremely successful for the Club winning 6 premierships until 1915 when football was suspended because of the First World War. Success continued in the 1920’s with another 3 premierships. Angaston continued to be a force in the 1930’s playing in 5 Grand Finals and winning 4 premierships. 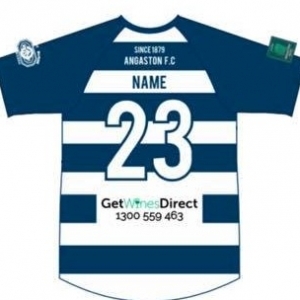 During this period a name emerged in the Club which was going to have a significant impact on the Angaston Football Club and the local Association for the next 75 years. A dynasty was about to begin. Brian’s son William won the Association U15’s medal in 1977 then went on to play 135 games for Central Districts – returning to Angaston he was A Grade captain for 5 years and coached the U17’s for 3 years. Today William’s son, Shannon after winning the Association U15’s medal in 2001 went on to play in 2 SANFL premierships with Central District and after being drafted into the AFL is an important member of the West Coast Eagles. Lacey Hurn coached the Club in 1937, 1938 and won the Mail Medal in 1938. He was president of the Barossa & Light Association from 1953-1967. Then took over as Angaston President from 1971-1974. Lacey’s son Tony, was a member of an A Grade premiership team – was Club treasurer in 1966. He was an important member of a group in forming the Association’s umpiring panel and is a Life member of the B.L. & G. Umpires Association. Ross Hurn was Captain/Coach of the 1945 Premiership team and after his playing days was an Association Commissioner for 15 years and for a number of years was an Association selector. For his services to football he was made a Life Member of the Association. A very talented cricketer he still holds the record for the highest score in the A Grade local competition – a score of 292 against Light Pass. He was a member of the local team that played against Don Bradman’s eleven on the Nuriootpa oval in 1937. Like the Hurn’s there are many other Angaston family names that have made a significant contribution to the Angaston Football Club over the past 100 years – names like Trescowthick, Chinner, Kleinig, Miles, Kempe, Sibley, Falkenberg, Hearl to name a few. In the late 1930’s another young, very talented Angaston sportsman started to make a name for himself – Bob Christie. Bob was not only a brilliant footballer but also a very talented cricketer. Playing for Glenelg, to this day he stills hold the record for the fastest Century in district cricket. Sadly Bob was killed in action in the Middle East during World War 2. A waste of a great talent. In the mid 1930’s Morgan, Lacey and Ross Hurn became involved in both football and cricket. Morgan an outstanding cricketer did not play football but left a very proud legacy. Three of his sons, Brian, Richard and Geoffrey played in A Grade premierships. Brian won the mail medal in 1970 and was Association leading goal kicker in 1957 and 1963. He coached the Club for 3 years, was Secretary for 11 years and President of the Barossa, Light and Gawler Football Association for 7 years. Brian also had an outstanding cricketing career representing South Australia in the Sheffield shield competition for many years. Richard won the Association goal kicking in 1965 and Geoffrey was Club secretary in 1972. The local competition started again in 1945 after being suspended because of the war. It proved to be a good year for the Angaston Football Club defeating Kapunda in the Grand Final and winning the 1945 premiership. However a lean period was to follow – it had to wait until 1955 for the next premiership. Then another lean period – but it came back with a vengeance winning in 1968 and 1969. This was followed by premierships in 1971, 1972 and 1973. Then the next premiership was in 1977. Ironically Angaston holds a unique record – it is the only Club to have played in a Grand Final drawn game – this happened on 2 occasions. First in 1969 when it drew with Nuriootpa and won the replay. Then in 1977 it drew with Kapunda and won the replay. In the 30 years since 1977 Angaston has only won 2 A Grade premierships – in 1986 and 2003. Angaston has provided many talented players who have gone on to play in the SANFL including – Bernie Mattiske (West Adelaide), Bill Tonkin (West Torrens), Glyn Trescowthick, Rufus Heidenreich (North Adelaide), Fred Leach (South Adelaide), B. Pfitzner (Norwood), Ken Obst (Port Adelaide), Paul Walker, Tony Walker, Malcolm Johnston, David Hayes, Peter Kleinig, Kym Lehmann, William Hurn, Scott Stevens, Ben Burgess (Central District) Jason Kingsley (Woodville/West Torrens), Paul Garnett, Trevor Reu (West Adelaide). 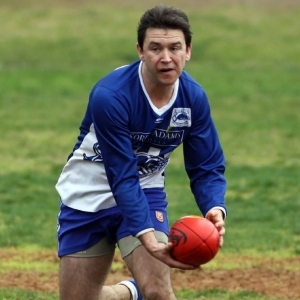 Players who have gone on to the VFKL/AFL include Kent Kingsley (North Melbourne, Geelong, and Richmond), Sean Tasker (Adelaide Crows) and Shannon Hurn (West Coast Eagles). Sam Colquhoun (Port Adelaide) and Jack Hannath (Fremantle) are the latest AFL additions. On the receiving end many talented players from the SANFL and VFL/AFL have played at Angaston and worn the blue and white jumper – Ron Benton (West Adelaide), Bob Philp and Ross Agius (Port Adelaide) Peter Vivian, Colin Stutley, Daryl Beale, Malcolm McGrath, Barry Norsworthy, Ron Harris, Fred Carabott, Trevor Smitham, Tim Jackson and Peter Collins (Central District), Mick Clingly, Steven Moulds and David Foote (West Torrens), Steven Moore (Woodville), Pat Tocaciu, Russell Gehling and Peter Cameron (North Adelaide), Tim McNeil and Ugo Colosante (Norwood) and in the 1930’s Gordon Watts (Western Australian State player 6 years in a row before playing for South Adelaide). Hugh Reimers (Western Bulldogs/Fitzroy), Daryl Beale (Richmond) and Owen Guyatt (South Melbourne). The Angaston Football Club is justifiably proud of its heritage – it has won more A Grade premierships than any of the other foundation clubs. Ironically it is still to win a Reserves premiership after playing in 10 Grand Finals. It retains its original colours of blue and white that it started with in 1879. Its picturesque oval is a landmark in the Barossa and will be the scene of many more great football matches during the next 100 years. Watch this space for 2019 events coming very soon!